The radius of the mandrel nose. The greater the wall factor (i.e., the ratio of tube diameter to wall thickness) the smaller this radius should be. Sharp radiuses are disfavored because they tend to break down quickly; however, larger radiuses increase the gap in tube wall support between the crown of the first mandrel ball and the full diameter of the mandrel nose. Therefore, the radius must be sized to provide the greatest amount of support without wearing out too rapidly. Generally a nose radius of between five to ten percent of the nose diameter will optimize these competing requirements. 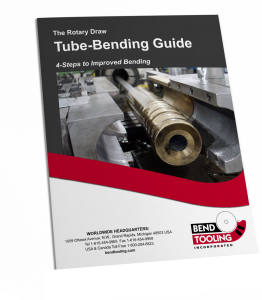 Generally, a large radius is preferred for low-pressure mandrel bending and a sharp radius for high-pressure. See the photograph to the right for an example of each type of nose radius.